The final entry in the Hunger Games series has arrived and in the tradition of the hugely successful Harry Potter and Twilight films, it has been split into two parts with the final film being released a year from now. While I haven’t read the books and can’t tell you if Part 1 creates a viable stopping point for the final film, I can say that this standalone portion of Mockingjay feels quite stretched at feature length and I have a hard time believing that this material couldn’t be skillfully condensed into one movie. Clearly this was a financial decision on the part of Lionsgate to milk their $1.5 billion (and counting) franchise as long as they can. Mockingjay picks up right where we left off from Catching Fire, with our heroine Katniss Everdeen, played by Oscar winner Jennifer Lawrence, living in the bombed-out District 13 and still reeling from the outcome of the Quarter Quell. Her actions in those Games have sparked uprisings and civil unrest throughout the Districts and the President of 13 Alma Coin, played with conviction by Julianne Moore, hopes to mold Katniss into a symbol of united revolution against the Capitol. She agrees under the condition that her lost love Peeta, played by Josh Hutcherson, be retrieved from the clutches of the Capitol and its corrupt President Snow, reprised with grinning menace by Donald Sutherland. The film has taken away what I always thought was one of the least interesting things about the previous entries, the Games themselves, but it hasn’t replaced them with much exciting material either. 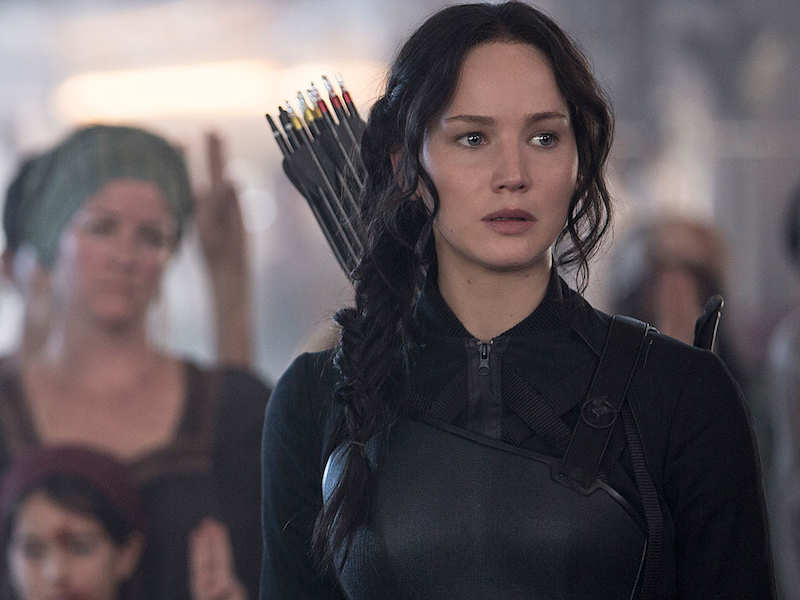 Fans of the series will likely be put off by the Katniss-less action in Part 1, in which the main character fires exactly one arrow in combat, although it does produce one of the movie’s most satisfying, trailer-ready shots. The majority of the material here is comprised of characters brooding or explaining or plotting, which may prove worthwhile for Part 2 but doesn’t leave us with much for now. All of the characters, Katniss included, feel sidelined and underutilized, often waiting for things to happen as opposed to moving the story along themselves. If that was a conscious decision on the part of director Francis Lawrence, it comes off more as spinning its wheels rather than organically building tension. The acting here is similarly dubious; I never imagined that Josh Hutcherson would give a more convincing performance than Jennifer Lawrence in this film (or any film, really) but it’s sadly the case here. Despite this, Mockingjay is not without its share of inspired moments. There are thankfully some beats of levity in a scene that finds Katniss botching her lines for an overproduced propaganda film that has cheeky notes of political satire embedded. I was most taken with a quietly poetic scene in which soldiers infiltrate the Capitol to retrieve previous Tributes, which frequently reminded me of the Abbottabad raid sequence in Zero Dark Thirty. Here’s hoping that the finale has more gripping scenes like this one but for now, it feels like we’re stuck with the world’s most expensive bookmark.